Former U.S. Senator Robert C. Byrd (D-WV) served in the Senate longer than any other man in U.S. history. He also held more leadership positions and cast more votes (more than 18,000) than any other person to serve in that body. Arguably, no one ever knew more about the Senate than did Byrd, and he wrote several books on the history of the Senate and even on the Senate in ancient Roman history. 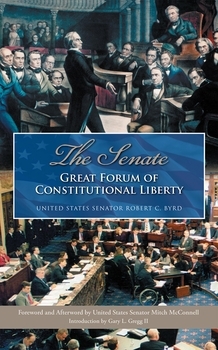 In this slim volume, Byrd discusses some of the lessons he learned during his time in the Senate and makes a strong call to defend the institution in the 21st century. The volume also includes an introduction by political scientist Gary Gregg and a Foreword by Senate Republican leader Mitch McConnell, along with several documents relating to the origins of the U.S. Senate during the founding period. It is an instructive volume on the origins, evolution, and current functioning of the U.S. Senate.